We loathe long ingredients lists too. Who has the time to read them, let alone go out and buy it all? This ingredients list might look overwhelming, but on closer examination you’ll see you’ve already got most of it in the cupboard. Just buy some coriander/cilantro on your way home from work, and knock it up for a delicious Friday night supper. Alternatively have it as a Saturday night dinner with the kids; they’ll love it too. First, cook the beans: heat the oil in a large pan. Add the onions and fry until soft and translucent. Add the garlic and fry for another 2 minutes, until it starts to brown. Add coriander/cilantro stalks and chilli flakes and fry for another 2 minutes. Add the beans and continue to fry over a low heat. This step takes about 10–15 minutes; you want the beans to lose their shape and have a porridge-like consistency. Season with salt and pepper. Take off the heat and stir in the crème fraîche and lime juice. To make the salsa, strain some of the juice from the chopped tomatoes; you don’t want them too sloppy. Put the tomatoes, coriander, lime juice and onion in a bowl. Stir and season with salt and pepper. Add chilli flakes, to taste, if you want. Stir the salsa into the refried beans. To make the onion topping for the tower, heat some olive oil in a small frying pan and throw in the finely chopped onion. Fry gently until the onions have softened and become translucent. While they are cooking you can make the tower. Lay the first tortilla in a baking pan or ovenproof dish. 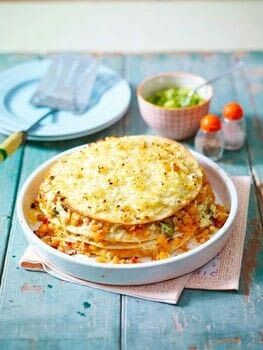 Spread a layer of the refried beans mix over it; it should be about 2–3cm (about 1 inch) deep, sprinkle over a layer of cheese and place a tortilla on top. Keep doing this until you have used up the refried beans mixture and most of the cheese and have got to the last tortilla. Place the last tortilla on the top, sprinkle over the remaining cheese and scatter the fried onion over the top. Bake for 10–15 minutes. While it’s in the oven, mash up the avocado, season with pepper and sprinkle with lime juice. Take the tower out of the oven when the cheese is golden and melted on top. Serve with guacamole on the side.